Hello and happy Monday to you! I wanted to let you know that I did a guest post over at Sarah's place yesterday. I wrote up a little tutorial for the Sixteen Tons quilt as part of her Hands2Help Charity Quilt Challenge. Hope you check it out! 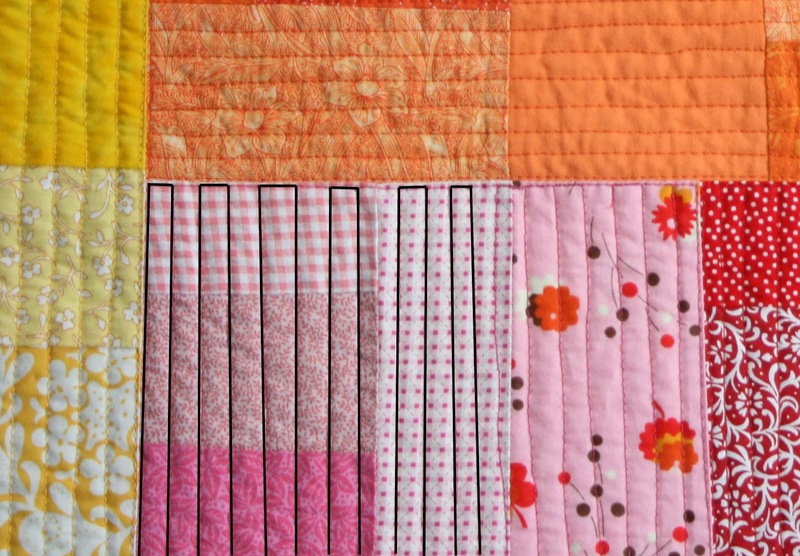 It's a quick and easy quilt to whip up for your favorite charity or just for fun. It's a good way to use up scraps, too! Also over the weekend, I started sewing a dress for me! There was much trepidation surrounding this event, but my sister, who has garment sewing experience, was visiting and she helped a lot. (It was sweet. At one point she said, "this is what I feel like when you are at my house and I'm trying to make a quilt." That made me feel so much better! I'm so thankful that I have a sister to sew with. Thanks, Clair, for your help!!!) Anyway, back to the dress....I'm over half way done and not sure that it's going to fit. But it's been a great learning experience so far. I'll keep you posted! I'm working on a new project. It's blue & green, scrappy, and I'm using 2.5" squares. ALL my favorites rolled into one! compared to a straight setting. Which do you like better? coal gray....mmm. i like it! brown polka dot...it would almost work, but too busy. sprout green....very nice. I think I would really like how some of the green squares would match and kind of fade into the background. latte...it's a lovely color, but nope! well...maybe? Like I said, I don't have a clear vision for this quilt yet...but I do have a few layout options I'm mulling over. It's very fun to be playing and watching it come together bit by bit. I cleaned my craft room this week (because I was procrastinating) and I thought it would be good to snap a photo for reference sake. HA! It's SO NICE to work in a clean space. I forgot how much so because it's been so long!! But don't be too impressed. The rest of the story is the landing (right outside my room) is a huge mess. Hopefully things will be reckoned with sooner if I keep walking over them. We shall see! The question I'd like to discuss today is...."Where do you draw the line between a tutorial vs. a pattern?" I've been pondering this question a lot over the past few months. And quite a lot just this week. I've also been talking it over with my husband, and Tara, and Cheryl. It's still not settled in my mind and I thought it would be interesting to hear your thoughts on the matter. Do you think about this at all? What is your take on it? edited to add: Thanks so much for your comments on this discussion so far! It's been very interesting to read your thoughts. In the comments Tara phrased my question much better. (thank you Tara!) So...the more detailed question is: How do you decide if a quilt should be made into a free tutorial on the blog versus if it warrants a pattern to sell? How about you? If you have a finish to share today (and I hope you do! ), please link to a specific post from the past week. We'd love to cheer you on as you finish! Lisette G, Nancy and Sue K.
Congratulations, ladies! Please email me your addresses so I can get your fabric to you. Welcome to finish it up Friday! I hope you've had a great week of finishing! I'm delighted to say that I am finally done with my rolling stone quilt! I had to push really hard to finish this one. It seems like this is all I've worked on for a LONG time....I'm glad I saw it through to the end! After auditioning a bunch of thread colors, ﻿I decided to use two colors to quilt it...teal and natural. I needed to pick two because I didn't want the quilting (if I were to use only teal) to muddy up the blocks. On the other hand, I didn't want the natural to contrast with all that teal background. 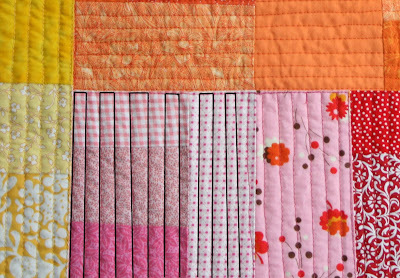 The solution was to quilt all the block pieces separately. Even with all the starting and stopping I had to do, I think it was a good choice. And it kind of looks neat on the back. I do love that lime green backing! The pattern is based on a traditional rolling stone block, and it's set on point. I love the almost circle effect of the block. The fabric is all from the Mod Basics line by Birch Fabrics. I think this was my first experience using organic fabric, and it is was very nice to work with. It quilted up beautifully. I'm excited to wash and dry it...the texture is gonna be FAB! Now it's your turn! Do you have a finish to share this week? If so, please link up to a specific blog post from the past week. Then go ahead and cheer on some other finishers as well. Happy Friday to you! Connecting Threads has a brand spankin' new fabric line called Matsuri. It's be-au-t-iful cotton lawn fabric. If you aren't sure exactly what cotton lawn fabric is, thankfully wikipedia knows! I had to do a little research myself. This fabric is so, so nice and the colors are wonderful! The top left print in the block above is my absolute favorite! I was very curious to how it would sew up, since it is such fine fabric, but it sews up beautifully. I'm sashing it with plain white quilting cotton, and I'm happy to report that mixing the fabric weights is working very well. It's another thing I was curious about. I was going to make it a lap size, as that seems to be my default size when it comes to quilt making. But about a week ago I was sewing with a few friends in the church basement. As I was working on my blocks they asked what size I was going to make the quilt. Heather, who's motto in quilting is "go big or go home", suggested I keep going. So....I'm now making this a king size. You gotta be careful who you ask advice from! When I showed my husband the photo, he said he really liked it. Works out well, since it will eventually be on our bed! This is what I've got so far. (Please excuse the weird lines from the church basement floor.) I'm not excited to add all that skinny sashing in between, but it's going to be totally worth it! Right??? Now, for the giveaway! Connecting Threads is kindly offering up 3 fat quarter stacks of this beautiful fabric line to three of my readers. If you would like to win a fat quarter bundle, please leave me a comment in this post. In your comment I'd like to hear what your default quilt size it. As stated earlier, I almost always make lap size quilts (60" x 72") if it's not for a specific purpose. I'm not sure why, it's just the way it is! I will pick the winners next Monday. The contest is open to US and Canadian residents only. If you are curious about cotton lawn or if you would like a few tips about sewing with lawn fabric, Connecting Threads has a fact sheet that you can download here. One more thing...my book is back in stock! Yay!